San Diego Suds: The best that it has ever been! 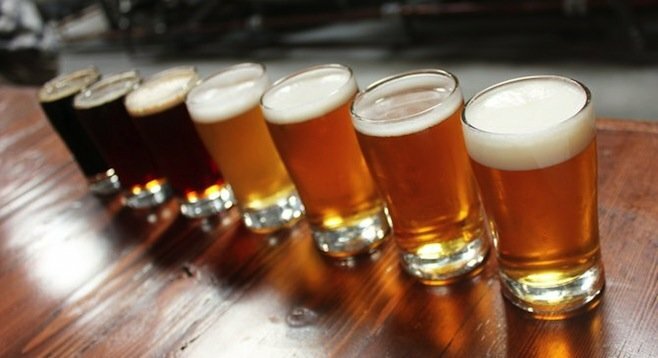 Editor’s note: With more than 150 craft beer breweries in San Diego the question often comes up which ones are the best. The editors of the feisty West Coaster craft beer magazine and website focused on how they are able to find the better brews. The following is a recent opinion piece by the magazine on how to discern substandard brews from the good stuff, plus a word or two about this year’s rookie brewers. West Coaster magazine has religiously covered the San Diego brewing industry for a good portion of this decade. As one of the publication’s writers I’ve learned that big part of our respective “beats” includes checking out new breweries. Interviewing so many brewery owners prior to their debut, it’s always interesting to see their visions brought to life. Unfortunately, the brick-and-mortar realization of these entrepreneurs sometimes pale in comparison to their lofty aspirations. Bad beer—it happens. Drinkers go into new breweries realizing it, but it doesn’t remove the sting of encountering subpar ales and lagers, especially when your purpose for visiting is to honestly assess the quality of an establishment’s wares in print. There was a three-year period from 2012 to 2015 when I was overwhelmed with the number of new San Diego County breweries opening with beer that tasted like bad homebrew or, worse yet, exhibited significant defects (diacetyl, dimethyl sulfide, acetaldehyde, isovaleric acid, oxidation, low attenuation, etc.). There were some years, as many as half (if not more) of the new operations I would visit would come in low on the quality scale, with some being downright unacceptable. It was a major problem, more for others than myself. I only write about beer, but those who make it—veterans of the local industry brewing good beer—grew increasingly and vocally concerned about the impact the rapidly increasing amount of substandard product would have on our region’s reputation. Fortunately, San Diego’s status as one of the finest brewing regions in the world has remained intact. So why bring up this dark chapter in an otherwise bright saga? Because over the last two years, visiting new breweries has gone from the iffy chore it had become to the inspiring pleasure that it should be in a premier county for craft beer. So often I’ve left a first session at a rookie brewery feeling pleasantly surprised and incredibly pleased; that lovely feeling that inspires you to want to come back and support the people behind these fledgling businesses. This heart-warming phenomenon has occurred with such regularity that I’d go so far as to venture that the beer in San Diego County, as a whole, is better than it has been at any point in this storied area’s nearly 30 years of beer production. Each year, I examine the new breweries that are performing best among their recently debuted peers. In the aforementioned era, it was rather easy to separate the cream from rest of the crop. If anything, some so-so interests squeezed in, but the past two years have been different. I have had to increase the number of new breweries to praise to a half-dozen, and even that forced me to leave out some start-ups worthy of recognition last year. Burning Beard Brewing, North Park Beer Co., Resident Brewing, Pure Project Brewing, Bear Roots Brewing and Bitter Brothers Brewing comprised my best-of rookie class for 2016, but I will be the first to say that popular operations Mason Ale Works and Mikkeller Brewing San Diego had as much right for inclusion as the others. In the end I had to split hairs, awarding points for operations that had great beer out of the gate versus those that seemed to find their way several months in. It’s a good time for brewers and drinkers alike when an octet of breweries of this quality open in a single year and I’m forced to scrutinize to this degree. So what happened to turn things around? Some would say that the current, crowded, ultra-competitive business climate demands it. There are more than 150 brewhouses churning out beer in San Diego County, and plenty more competition from outside interests as well as the ever-present multi-national conglomerates and their acquired and crafty brands. Certainly the need to compete is a driver, but I believe there’s more to it than just that. After all, many say that if you don’t make good beer you’ll be weeded out and left behind, but we have decades of empirical evidence that proves otherwise. So there has to be something else, something more. I think in many cases, it comes down to pride, which is not a deadly sin when it motivates people to be and do their best. From interviewing many new brewery owners, it seems more and more of them are asking questions of local brewing professionals during and beyond the start-up process. Local brewery owners’ and brewers’ openness to newcomers and would-be competitors has been a hallmark of the San Diego suds scene and cited innumerable times as a key reason the region has risen to prominence. More importantly than having conversations and posing questions, it would seem these entrepreneurs are listening, even when the answers and feedback they receive aren’t what they want to hear, and adjusting their courses accordingly or striving harder to produce quality beer. Many are the homebrewers in the past who were so enamored with their recipes and the 100%-positive feedback of their friends and family that they felt no need to ask for help or lean on the immense experience located almost inconceivably right at their fingertips. And speaking of homebrewers, while there’s still a large number of them getting into the professional brewing ranks without ever having worked a day in a commercial brewery, more brewery owners are either employing or consulting with fermentation specialists who have built résumés sporting stints well beyond their garages. And it’s making a big difference in the quality of product. Since Bill Batten, the former head brewer for Mikkeller San Diego and senior brewer for AleSmith Brewing, resigned in May, he has consulted on a handful of projects, offering invaluable advice, while he waits to take the reins at his future home, TapRoom Beer Company, a brewpub being built in North Park by the owners of Pacific Beach bar and eatery SD TapRoom. Other brewing-industry veterans have been brought in to ensure smoother sailing, both at work-in-progress interests and already operational facilities, and it has paid off in each case. Then there are the large breweries incapable of providing enough advancement opportunities to maintain staff because there are only so many master, head, senior and lead positions to go around. This requires brewers further down on the org chart to climb the ladder by switching employers. Of course, some of them were only there to get their boots wet in the first place, learning the ropes in order to apply lessons and experience to their own breweries at some point. To see this in action, one need look no further than the Brewery Igniter complex in North Park, where Ballast Point Brewing alums Clayton LeBlanc and Nathan Stephens are gaining a fast name for their new employers at Eppig Brewing behind top-notch beers, and former Stone Brewing small-batch brewer Brian Mitchell is crafting quality out-there beers at his passion project, Pariah Brewing. And up in Vista, another pair of Ballast Pointers, Ryan Sather and Chris Barry, have won over North County imbibers at their fantasy-themed Battlemage Brewing. Frankly, experienced talent like this wasn’t available in such quantity in the darker days. There are more skilled employees for brewery owners to secure and utilize to their fullest, and they are, even with an unprecedented level of attrition. In recent years, San Diego has lost a certain percentage of top-name talent to other regions. Key departures include former Green Flash Brewing brewmaster Chuck Silva who returned to his Central Coast roots to open Silva Brewing, Pizza Port/Solana Beach head brewer Devon Randall moving to Los Angeles to helm Arts District Brewing Company, as well as Cosimo Sorrentino and Ehren Schmidt of Monkey Paw Brewing and Toolbox Brewing, respectively, both of whom moved to Denmark to accept high-profile positions. Further aiding the cause are the camaraderie and support of San Diego industry organizations such as the San Diego Brewers Guild and the local chapter of the women’s advocacy-focused Pink Boots Society. These have always been factions built to support the rising tide and individual riders of that wave. They are safe havens of sorts for those who choose to pull into port. There are still those who eschew the Guild or feel that mostly-volunteer organization should come to them and win them over before they join (incorrect), but largely, those who want to be a part of the local industry realize the strength and resources that come with the numbers and relationships to be formed in such groups, and register their businesses as soon as they are able. Not coincidentally, member breweries tend to do much better than those who elect to be outsiders. In addition to the openness and espirit de corps of the Guild and PBS, there is an undercurrent of don’t screw this up for the rest of us that inspires if not forces members to do their darnedest not to fall out of favor with membership by hurting the region’s overall reputation care of bad beer or ill-advised business practices. It’s hard to show your face among your contemporaries when your business or its products are known for having a counterproductive effect that potentially effects them (unless you are completely oblivious and lack self-awareness, and there certainly are plenty of those individuals in the mix). To a degree it comes down to the power of peer pressure, which like pride, it is not necessarily a bad thing when it motivates people to be and do their best. The past two years have also seen more brewery closings than any 24-month stretch in the history of the local brewing scene. A number of these operations made poor beer, and their removal from the pool raised the level of the liquid within it. And a significant number of the breweries that previously made low-quality beer have upped their game over the years. To some extent, that has to do with the natural evolution of brewing. More people are doing it, thus information regarding techniques yielding optimal results is more readily available than ever before, as is top-notch and ever-advancing technology, but in most cases, it simply comes down to those operations gaining much-needed experience and driving themselves to be better, which is to be recognized and praised. Four years ago, I ventured the opinion that there had never been more bad beer being brewed in San Diego than ever before, but things have changed for the better. Exploring new breweries—and breweries in general—is fun again, and more likely to involve defect-free and, often, exceptional ales and lagers. For the reasons above (and many more), the quality of San Diego beer as a whole is better, in my opinion, than at any time since I’ve been covering this beat. Kudos to the many in the industry working collectively and individually to maintain our region’s integrity and reputation.